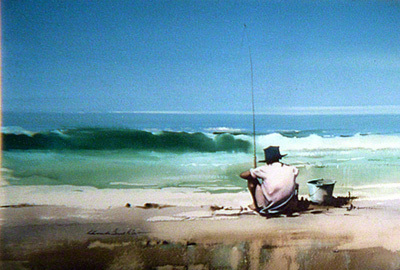 A water colour by Claude Buckle showing a fisherman on a beach contemplating. A water colour by Claude Buckle Contemplation. A water colour by Claude Buckle showing a fisherman in contemplation. The picture is an actual scene from a location in the Ile de Re France and shows the beach and waves. There is a bucket beside the fisherman and a long fishing rod and line going out to sea. The scene has been used in other paintings and is quite typical of the Buckle style of figure painting. Created in 1972.